This dish came about from trying a spicy ramen last weekend in Sakura Japanese restaurant in Southsea (see my review for the restaurant here). The broth was really meaty and spicy, but not eye-wateringly so and it got me wondering what sort of chilli had been added to give it such a wonderful flavour without too much heat. I had already heard of laoganma chilli pickle, a Chinese relish made with black beans and crispy chilli in oil, but had never tried it, so hunted out a jar in my old favourite oriental supermarket in Southsea, Akram’s. This shop sells pretty much every ingredient you could ever want for Chinese, Japanese, Korean and Indian cooking. Having tried the laoganma pickle, I felt it would go really well in a broth for ramen, as it is tasty and sour, but not mouth numbingly so. And so this dish was born! I have added some more summery toppings to this dish, as it is still very warm here and I felt that the intensely flavourful broth and pork didn’t need lots of extra flavours in the vegetables. Also, the mooli, radish and tomatoes are all home-grown from our garden! While we were in Hampshire last weekend we visited the Isle of Wight and I was able to get my hands on The Garlic Farm’s smoked garlic and The Wild Island’s lemongrass and ginger chilli oil. Smoked garlic gives a more delicate garlic aroma with a smoky undertone and the chilli oil just has a hunt of flavour which I find compliments the garlic well, so I used these as flavour for the broth and also as a tasty topping. This is possibly my favourite ramen recipe I have created so far- the spicy, meaty broth is so tasty and the pork belly works so well as a topping. It is everything a bowl of ramen should be! Please note: If you see my pork recipe, you will see that I used the liquid from cooking the pork, which I added to the pan with chicken bones and topped up with water- I simply added an onion and a few stalks of celery, salt and pepper and cooked for an hour and a half before straining out the bits to leave the stock. You don’t have to do this- but it does make a wonderfully meaty stock from which to make your broth. To accompany: Sometimes simplicity is best when combined with a dish of such intense flavours: I served a simple cup of Chinese jasmine tea alongside this ramen, with its delicate floral flavour, which I find works as a palette cleanser when eating spicy foods. I got my jasmine tea from China, but try T2 Teas China Jasmine loose leaf tea. Add the grated mooli to a bowl of cold water and leave to soak for ten-fifteen minutes while you prepare everything else. Peel the garlic cloves and slice thinly. Add 2 tsp. of the chilli oil (you’ll add the other tsp. to the broth later) to a small saucepan and heat on high. Add the garlic and fry until it turns golden and starts to crispen up, making sure it doesn’t burn or it will go bitter. Take off the heat and reserve. Add the stock to a wok and bring up to the boil. Turn down the heat to a simmer. Add the chilli bean sauce, laoganma chilli pickle, soy sauce, mirin and the other tsp. of chilli oil. Stir well to combine and add white pepper to taste. Add a third of the fried smoked garlic to the broth. Taste the broth to check for seasoning and flavour. If it needs it, add a little more chilli bean sauce and laoganma. You are aiming for a sweet and sour flavour with a spicy kick, but it shouldn’t be extremely hot. Keep the broth warm while you prepare your noodles. Cook the ramen noodles as per pack instructions. Drain the mooli in a sieve and squeeze any excess water from it with your fingers. Drain the noodles and divide between two bowls. 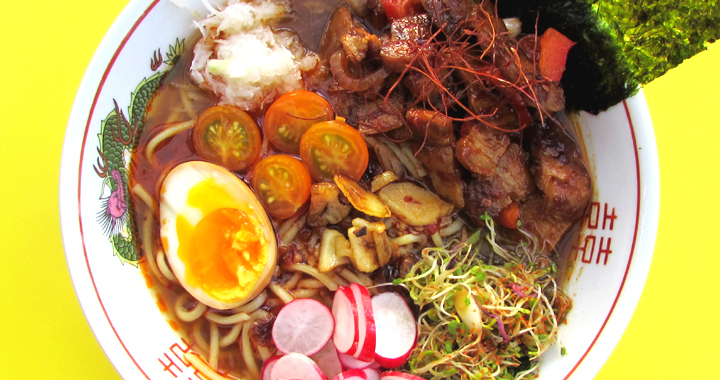 Ladle the broth over the noodles and then top with the pork, ramen egg, beansprouts, mooli, radishes and tomatoes. Sprinkle the chilli strands over the pork. Divide the remaining garlic between the two bowls, placing a little pile in the middle of each. Place the nori at the side of the bowl, wedged against the pork so that it sticks out of the broth and stays crispy. Posted in Ramen Dishes, Recipes and tagged Chilli, Laoganma, Pork, Ramen, Smoked Garlic.